Was doing some research and found an Occupation of this individual, and the Industry on a 1920 Census Record. A Timer in a Canning Company. What is that ? This was in Carroll County, Maryland so what is going on there that might be of interest. Not finished my 2nd cup of coffee, I decided to see what this was all about, and I did. The names of the people I am researching is not important here, but what is, seeing something that might seem weird (ok, unusual) but finding some documents that have some incredible amount of historical information. I did s search for “canning company, westminster, maryland” (copied and pasted my search criterial. Some great hits were returned, including a “Maryland Historical Trust Determination of Eligibility Form” A 24 page form for a preserving a property and buildings. At the top of the document, nothing was of interest, but I had to read down this document to put the house into historical context. On page 5, was mention of the Cannery that (remember the house of the subject) and the Family I was researching mentioned that in 1868 this cannery was established. The name is probably one or two generations further back from the information that I have, not sure if I will try to get back there, but it put that family into historical context. 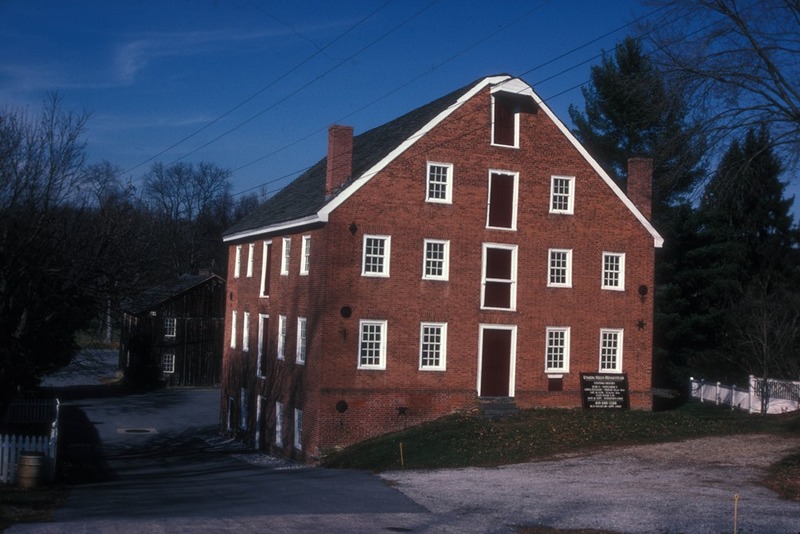 The real kicker is, by follow that “what is this cannery” question, the Google Search found a web site on the history of the Union Mills Homestead (built in 1797) but a calendar of events that will take place this year. One rabbit hole that I am glad that I followed. Is re-organizing your files helpful ? While taking a break from “business as usual” I finally am taking some time to make sure that my files are organized. Having moved a couple of years ago from an apartment to a house, I finally have a Genea-Cave, an almost real office. I had a pretty good record of my files, but haven’t done an inventory of what I had as I knew I had some folders that were not labeled, thus not in the right place. One of those folders had a very long letter from my Uncle to the “real” Genealogist in the family, one of my Texas Cousins. She was in the process of writing a book “Hell and Beyond”. I have talked about this book before, but while she was doing the research for the book, apparently she sent letters to the Pennsylvania Cousins for information. I am posting the 1st page and the last several pages of this 24 page document. 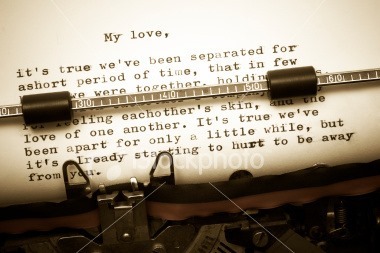 Will post some of the letters that were transcribed dating from 1888 to 1932 over time. I’ll start with the opening and closing of the document. Betty made copies of thy letter and distributed them to the five of us children of H. Russell Worthington. I have read my copy with intense interest and hope that I can contribute in some small way with information which I have gleaned from two old tin boxes of papers, letters, etc., some of which came into my father’s possession following the death of Aunt Lizzie (Elizabeth Farnum Worthington Russell) in 1924. Coincidentally, did thee realize that thy letter was dated July 27th, my father’s birthday? Or was it coincidental–maybe providential? I am thrilled to hear that thee is working toward the publication of Uncle Wistar’s writings and am looking forward with great anticipation to reading “Hell and Beyond” upon its completion. Please reserve four copies for us and our three children. I, too, have been faced with many gaps in time and information. 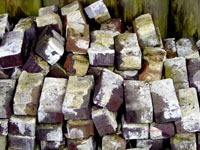 There are so many missing pieces, like in a jig-saw puzzle. An old birthday book of Aunt Lizzie’s has been very helpful–she had recorded in the back of the book some dates of marriages and deaths. Samuel Worthington and Sarah Catherine Reeve (sometimes called Kate) were married 2nd Ho. 15-1872 at Cottonwood Meeting House, Lason (.sp.?) County, Kansas. Samuel Worthington died at Richfield, Morton County, Kansas, 5th No. 30 — (the year is blurred, but in my father’s writing) “1897”. This conflicts with 1896 as the year of death on the family tree which I am enclosing with this letter. More about the family tree later. Frances, I must wind this yarn up and get it sent off to thee. After all, thee is the one who is writing a book, not I. The first thing I question about the content of thy draft of “About the Author of ‘Hell and Beyond” is J. Wistar Worthington’s birthdate. From what I have found in several places it was 12-29-1888. H. Russell Worthington was born 7-27-1887 and the two boys were only seventeen months apart. Based on information which I have at hand, I have concluded that Sarah C. died in February ? 1894 and Samuel died 5-30-1897. If this is wrong,’ I hope that someone will provide me with exact dates. If 1897 is the correct year of Samuel’s death, H. Russell W. was not quite 10 years old and J. Wistar W. was 8 years and 5 months old at the time. I have already covered the rest of what I have learned about the early schooling of H. Russell W. and J. Wistar W. Wistar W. and about their being sent to Aunt Lizzie’s, the Moorestown Academy and Westtown Boarding School. Does thee remember hearing about H. Russell and J. Wistar and the other children going out on the prairie to gather “Buffalo chips” to use as fuel in the stove? May I ask- who was the relative thee refers to who asked for the use of the “College Fund” and died before it could be repaid? Does thee have a picture of the log cabin in which our fathers were born? Samuel W. attended Westtown Boarding School for one year, 1852-1853, entering at nine years of age. Aunt Lizzie, Aunt Sallie and Uncle Henry also attended there. Best of luck to thee, Frances, in thy endeavor. I know what a monumental task it will be. My sincere appreciation is extended to Betty for typing all of these pages. She and Harvey have done this as their contribution toward thy project. What does Indenture really mean? Over the past several days, I have been talking about Capt. John Worthington (1650-1701) and have used the term Indentured Servant a number of times. I went to the Maryland State Archives website and did a search for Indentured Servant. Knowing that I might find some results with either one of those two words, as I didn’t put them in quotes. I found a result that had “John Worthington” and “indenture” in it. Reading the article, that was already transcribed AND the Image a click away, it had some information that fit with other information I already had. BUT, I couldn’t understand what it was really saying. I know it was a Legal Document and that it had something to do with a Land Record. So, what do I do, I send an email to +Judy G. Russell, CG, CGL, The Legal Genealogist, to get some clarification on what I was looking at. Stepping back a minute, I had done research on that Indentured Servant topic before and found a Wikipedia Article on the topic. Oh, I am looking for a record like the one on the WikiPedia webpage for Capt. John. That web page is what was in my mind when I read this article from the Archives and tried to share my question with The Legal Genealogist. I was expecting the usual “it depends” answer. Not this time. The article that I found, isn’t what I was looking for, but I have added a few new names to my Capt. John FAN club (Friends or Family, And, Neighbors). One of the names I had seen before, the other two I hadn’t. One in England the other in Maryland. AND it puts Capt. John still in England in 1676 or 1677, about where I expected to find him there, “of Manchester in the County of Lancaster in the Kingdome of England” and the property “neere” Ashton. Lesson Learned: I need to keep remembering to put the terms that I might find in a document into historical context and don’t forget the Law at the time and place. I just find it very interesting that a 17 year old lad, would be part of a Land Transaction. My sincere thanks to Judy G. Russell for her awesome responses to my questions. And she was so kind to allow my to share this with you. Thank you!!! 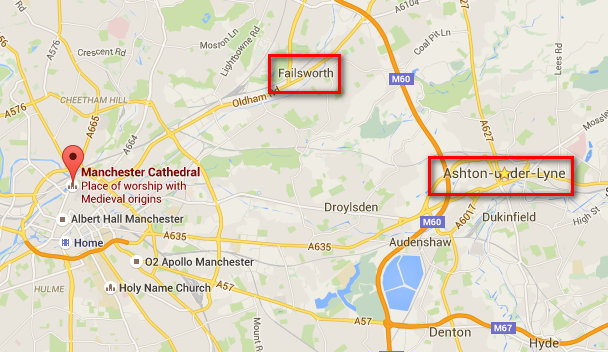 Manchester is where it is reported that he lived, Ashton-under-Lyne (current name) is where the property was, and Failsworth is where there is another reference to Capt. John and other Worthington’s. A whole book has been about that Worthington family. For years, I have seen references to Samuel Worthington, brother of Capt. John Worthington (1650-1701). But have always lost him in Somerset County, Maryland. Other Worthington researchers have not been able to find any descendants. In the past couple of Blog posts, I have mentioned that I was looking in the State of Maryland Archives website. I think that I found out why. GRATED: by 1689, as a free adult. RESIDED: in Somerset Parish, Somerset County. CHILDREN. Probably died without progeny. I have some follow up to do on this, to see if I can verify what is in this article, so I have a few more bricks to move out of the way to make sure I haven’t miss anything coming forward in time. Now, I have to go back to the other side of the pond to see if I can find John AND Samuel with their parents. Still looking at the Maryland Archives, identified a number of records whenever I get back down there when I ran across, what may be, THE record I was looking for. Of note, the Marke Cordes mentioned above was also mentioned in the English property transaction in my earlier blog post. Now to figure out what the document really means. Was he, or Was he NOT an Indentured Servant? I hope that I have someone to take a look for Capt. John Worthington (1650-1701) in some records, at the Maryland Archives. The long told story is that he came from England in the mid to late 1600’s, probably around 1675. Further, the story was that he was an Indentured Servant of “Lord Baltimore”. Over the past couple of days, I have been trying to understand WHICH Lord Baltimore, as there may be as many as 7, and when “he” would have crossed the pond, bringing the lad John Worthington. That was one mistake. The mistake being that John Worthington was “on the boat” with ”Lord Baltimore”. The second mistake was what an Indentured Servant really was. Mistake number two. What I currently understand that term to mean is that someone PAID for the passage of “the indentured servant”. When of realized those two mistakes, I think I have determined which “Lord Baltimore” paid for his passage. Charles Calvert, the 3rd Barron Baltimore was in Maryland, in 1675. Right “title”, time, and place. Now to find a record of that, and my research says there will be records. As I have learned in the resent past, and currently teach, BEFORE you visit an Archive, see what that have Online. I did and the Maryland Archives have a number of volumes with Legislative Proceedings on this topic. Haven’t found what I was looking for yet, BUT, I did find this. A nice profile for Capt. John. My new conflicting information is high lighted. 1678 or 1679 as a FREE Adult. The full article has too many “probably” statements, I get that, but there are even more questions that come up. His parents names are OK, but later on, there is mention of Samuel Worthington that is “possibly” related to John. Samuel has a profile as well, but he disappears from records within a generations, I have known about Samuel before and have looked, and he disappears. Not at all comfortable about this new information. However, in the profile is mention of a Land Transaction in England 01 February 1676/77 which will be my next “Bright Shiny Object”. I believe this is the Last Will for Capt. John Worthington (1650 – 1701). It will take a while to transcribe it, but I am certain that it is him. At first, I wasn’t sure, the way that the information was presented on the screen, but reading (what I could) it’s his. I had a date in my file for when the will was Proved. The date was the same, the year was not, but I think the information I had may have been in error. Two children weren’t listed, be that was because they were born after the will was written, one of those children died very young, the second carried the name of that baby, and was Charles from whom I descend. Yesterday I spent a while trying to make the Pendennis connection, the plantation and the castle, so I see a trip to Annapolis, Maryland in my future. Just not seeing any hint as to why Capt. John would name his plantation Pendennis. But, did HE name it or when what his plantation named. Property had names, which the will pointed out and I have other records of, but why Pendennis. Why would at “young lad”, that is Capt. John have that name linked to him. The Pendennis Castle was involved in a siege in 1646. King Charles I was the King at the time (trying to confirm that), and there was a John Arundel (1576 – 1654) tied to the castle. Arundel being the county, in Maryland, where Capt. John lived. Thank you Ancestry.com for this new Record Collection. It should keep me busy for a while.